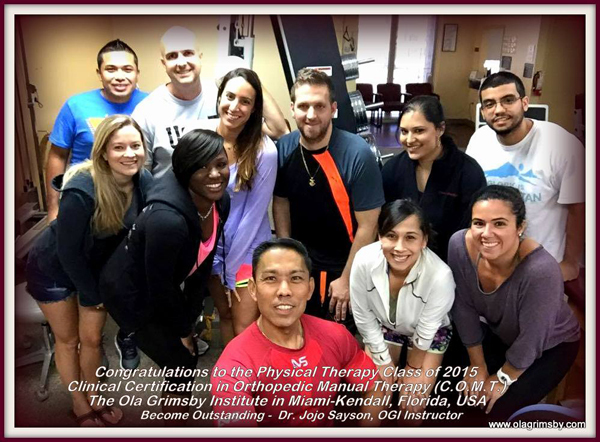 Before the year 2015 ends, I would like to express my tethered pride as a teacher-instructor & friend to a wonderful group of Doctors of Physical Therapy who all passed their examinations to earn their new sub-specialty with a Clinical Certification in Orthopedic Manual Therapy after a year of lectures, demonstrations, & countless hours studying & practicing the learned new skills in scientific rehabilitation of patients. Thank you for allowing me to be your instructor together with our OGI Team. Thank you to our Founder, Dr. Ola Grimsby for making a difference in the lives of thousands worldwide both clinicians & patients. To my students, always strive to become outstanding & may God bless you in your quest to make a difference in the lives of those you touch to heal. Here’s wishing you all an amazing 2016 of new dimensions in professional growth & discovery. Congratulations on your successful completion! I am so very proud of all! Cheers!